Newton Stewart are poised to win a second trophy this week when they take on Mids in the Potts Cup Final on Monday night. 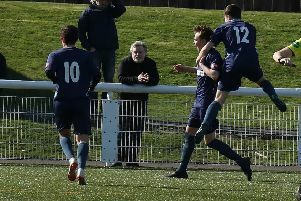 There are two Cup Finals and one Semi Final scheduled to be played this coming week with the final of the SFA Regional Cup (South) taking place on Saturday when Lowland League side BSC Glasgow lock horns with East of Scotland Premier Division side Civil Service Strollers. On Monday night the Potts Cup Final takes place at St Marys Park, Kirkcudbright when Mid-Annandale play Newton Stewart for the silverware. It is twenty seven years since the Creesiders won this particular piece of silverware and the Lockerbie side have never won it since joining the South League. Having beaten Wigtown recently Mids will hold no fears going into this match and particularly as the two teams always seem to enjoy close results when they meet. On the other hand Newton Stewart saw off a strong Edusport Academy team in the semi-finals and will be full of expectations of landing another cup to add to the Tweedie Cup that they won a couple of weeks ago. In any case a good exciting match is in prospect to which a large crowd of spectators are expected to attend and should the Lockerbie side win this match it would be their tenth victory in succession. On Wednesday night Mid-Annandale travel to Trammondford Park to play Wigtown and Bladnoch and again will go into this encounter knowing that they are more than capable of producing a positive result. The home side though will start as favourites to progress but it could well take more than the regulation time to find a winner.